Let us help you find the best deals that do not break the piggy bank for the bachelorette party. Although this bachelorette party supply will also be in our bachelorette games section, it also is a very popular item to hang on a wall as a decoration. This classic and most popular bachelorette game takes the “Pin the Tail on the Donkey” game to a new level. Again, this game is awesome as a decoration on the wall and can be found for $7.99. No matter where you will be, most likely you will be drinking or eating. It is always great to have some bachelorette napkins which are a popular bachelorette party supply since they are colorful and make great bachelorette party decorations on tables and even hung on walls. Usually bachelorette napkins come 8 or 10 to a pack. You can also find bachelorette party trivia game napkins that are excellent as napkins, decorations and have a bachelorette game on them. Bachelorette napkins should run anywhere from $3.00 to $5.00 per pack. Nothing says bachelorette parties better than confetti. Decide whether you want to go mild or wild as there is bachelorette confetti that covers both. Sprinkle some of the confetti bling on tables, in bachelorette party invitations or use it as bachelorette party fairy dust as you enter any room. A very cheap bachelorette supply ranging from $1.50 - $4.50. Every party is great when wearing party hats to bring in the occasion. Although you may always have someone who does not want to wear them, have everyone put them on for at least a few minutes when starting the party or when the bride-to-be enters the room. They are very similar to new year’s hats that most love wearing to bring in a festive occasion. These bachelorette supplies are very reasonable and are a top item for bachelorettes. This one-in-all bachelorette supply pictured is excellent for away or home parties as it includes all the essentials you need to have a great time at the last night out! You can also find other great bachelorette boxed sets that make it easier to get everything at once if you don’t want to spend too much time shopping for bachelorette party supplies and discount the prices even more of what the bachelorette party packs include. One of the most popular of the bachelorette party supplies are bachelorette party rings. There are many rings on the market. Some light up, some state 1000 Karat bling and others are in the shape of a willie. There is also a bachelorette shot glass ring that is cute to drink from. These bachelorette supplies are reasonably priced and make great bachelorette party favors for each of the girls. Please let us know more of your ideas for bachelorette parties and we will post them on our entertainment idea section. 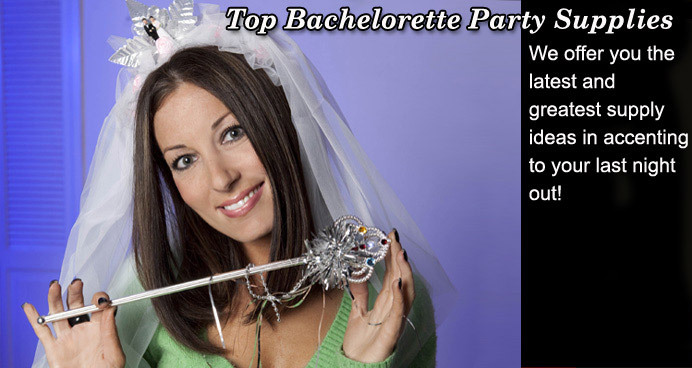 We hope to hear from you and you can email us at bachelorette@bacheloretteparties101.com.